the original ball became defective, unless play was stopped inside the goal area, in which case the referee drops the replacement ball on the goal area line parallel to the goal line at the point nearest to where the original ball was located when play was stopped. 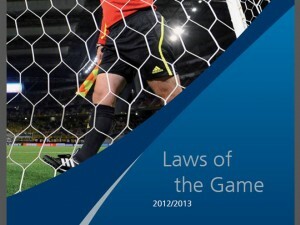 The ball may not be changed during the match without the authority of the referee (16 LAW 2 – THE BALL). Such a logo on a ball indicates that it has been tested ofﬁcially and found to be in compliance with speciﬁc technical requirements, different for each logo and additional to the minimum speciﬁcations stipulated in Law 2. The list of the additional requirements speciﬁc to each of the respective logos must be approved by the International F.A. Board. The institutes conducting the tests are subject to the approval of FIFA. In matches played in an ofﬁcial competition organised under the auspices of FIFA, the confederations or the member associations, no form of commercial advertising on the ball is permitted, except for the emblem of the competition, the competition organizer and the authorized trademark of the manufacturer. The competition regulations may restrict the size and number of such markings. Where goal-line technology (GLT) is used, balls with integrated technology are allowed, but they must either be “FIFA APPROVED”, “FIFA INSPECTED” or “INTERNATIONAL MATCHBALL STANDARD” (see “Decision 1”). has a pressure equal to 0.4–0.6 atmospheres at sea level. the match is restarted in accordance with the provisions of Law 8.
the “INTERNATIONAL MATCHBALL STANDARD” logo. Such a logo on a ball indicates that it has been tested ofﬁcially and found to be in compliance with speciﬁc technical requirements, different for each logo and additional to the minimum speciﬁcations stipulated in Law 2. The list of the additional requirements speciﬁc to each of the respective logos must be approved by the International F.A. Board. The institutes conducting the tests are subject to the approval of FIFA. Member association competitions may require the use of balls bearing any one of these three logos. In matches played in an ofﬁcial competition organised under the auspices of FIFA, the confederations or the member associations, no form of commercial advertising on the ball is permitted, except for the emblem of the competition, the competition organised and the authorized trademark of the manufacturer. The competition regulations may restrict the size and number of such markings. the match is restarted by dropping the replacement ball at the place where the original ball became defective, unless play was stopped inside the penalty area, in which case one of the referees drops the replacement ball on the penalty area line at the point nearest to where the original ball was located when play was stopped. the match is restarted by retaking the kick if the ball bursts or becomes defective while a direct free kick without a wall, a kick from the second penalty mark or a kick from the penalty mark is being taken and does not touch the goalposts, the crossbar or a player and no infringement is committed. In matches played in an ofﬁcial competition organised under the auspices of FIFA, the confederations or the member associations, no form of commercial advertising on the ball is permitted, except for the emblem of the competition, the competition organiser and the authorised trademark of the manufacturer. The competition regulations may restrict the size and number of such markings.